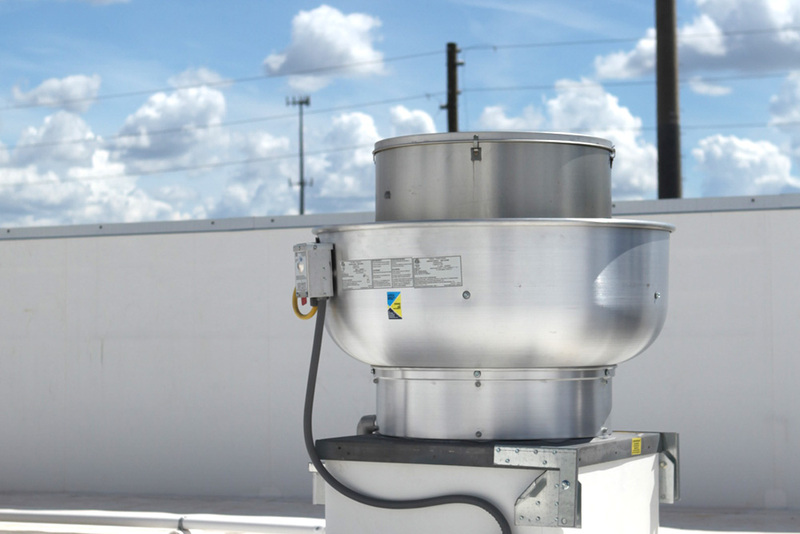 VXD200 - High Speed Direct Drive Centrifugal Upblast Exhaust Fan with disconnect switch and 20-3/4" wheel. Exhaust Motor: 3.000 HP, 3 Phase 208 V, 60Hz, 9.5 FLA, ODP (Open Drip Proof), Premium (E-Plus3) Eff. Benefits of Direct Drive Fans with VFD include – Fan speed control for balancing, soft start for increased motor life, reduced maintenance and failure potential due to elimination of belts, pulleys and bearings. Grease Cup for kitchen-duty centrifugal exhaust fans. Standard Hinge kit for exhaust fan roof curbs. Heavy Duty Hinge kit for exhaust fan roof curbs.